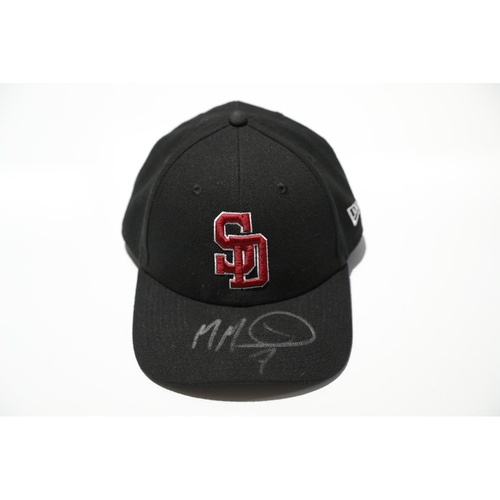 Manuel Margot Autographed, Game-Worn Stoneman Douglas Eagles Cap (Not MLB Authenticated). Worn during the Padres Spring Training Game against the Mariners on 2/23/18 at Peoria Stadium in Peoria, Arizona. This cap comes with an adjustable strap to alter the size. 100% of the proceeds will benefit the Broward Education Foundation, serving as the official victim's fund for families affected by the recent shooting in Parkland, Florida. The Padres Foundation serves as the charitable arm of the Padres baseball club. The Foundation is invested in supporting youth and those who serve (military and First Responders) in the San Diego and Baja regions to build community pride through positive connections with fans, players and staff.